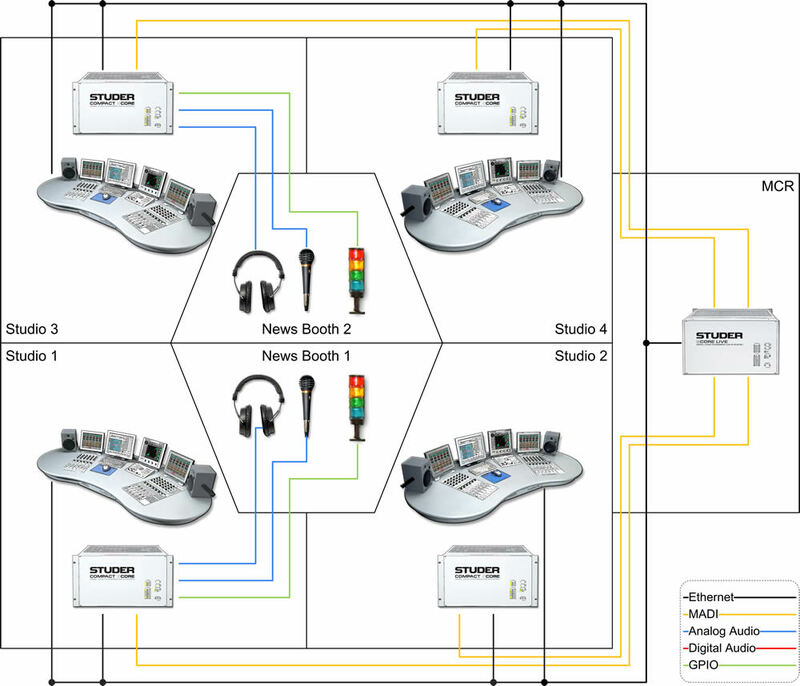 The Studer RELINK Resource Linking I/O Sharing system can link numerous Studer consoles in various locations of a Broadcast facility to allow audio source and control data sharing across a wide network. One of the benefits of the Studer RELINK system in comparison to others is that it is based totally on Studer’s existing SCore system which is an integral part of a Studer console architecture, so no additional hardware or breakout boxes are required to complete the network. 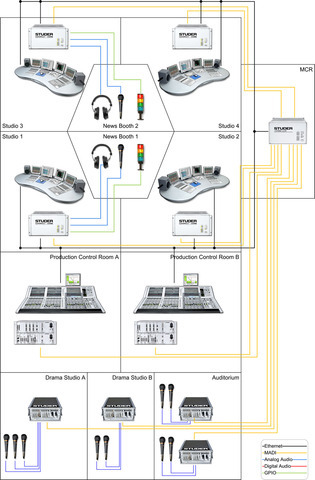 Any combination of Studer Vista (5, 6, 7, 8), OnAir 2500 and 3000 consoles and Route 6000 can link with each other via RELINK, communicating over TCP/IP. Other console-based networking systems on the market are often restricted to a single type of console. RELINK is seamless, scaleable, flexible, and can start with a simple link between two Studer consoles, and scale up to multi-console systems using a two-step topology where all signals are matrixed through a central device, for example the Studer Route 6000 system. To use RELINK, Studer consoles must be updated to the newest software versions – 4.1 for Vista, 3.1 for OnAir systems and 2.0 for Route 6000 systems. 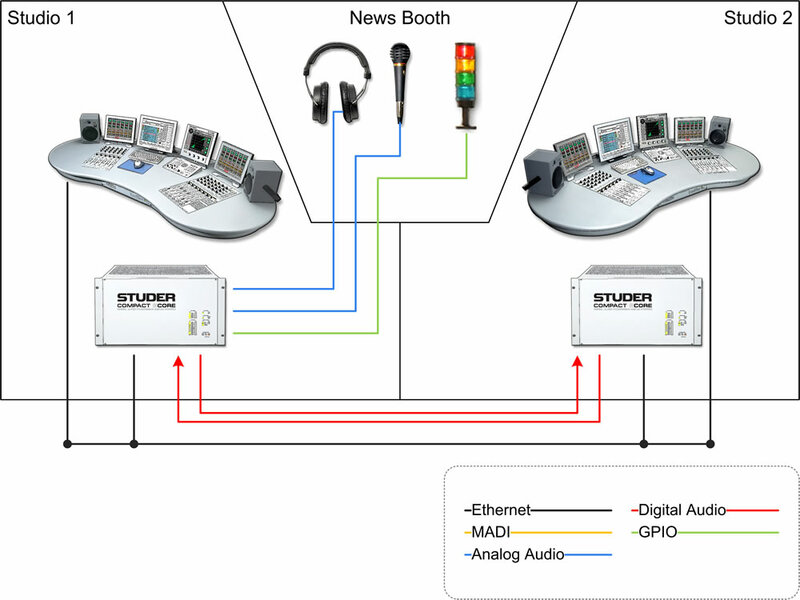 Studer’s D21m I/O system forms the heart of all the input/output connections, and network audio is not restricted to a single transport type - audio interconnects may be made through conventional MADI, AES, ADAT, regular copper analogue lines or even HDLink. Each D21m frame can be configured to accept up to 384 inputs and 384 outputs, with numerous options for audio interface types including analogue, AES, SDI, Dolby E and MADI, all available in cost-effective modules which maximise channel usage and hardware capacity. These inputs and outputs can be shared with any or all of the mixing consoles. Source selection is transparent, and signal labels are automatically transferred to the consuming locations, so the operator always knows which source is connected. Signal takeover between studios is seamless, so RELINK is well-suited for live transmission switchover. A resilient mic take-over mechanism ensures that mic control parameters such as analogue gain, phantom power, etc. are not changed unintentionally but require a conscious confirmation of remote take-over. With OnAir consoles, local monitoring at the point of use is turned off automatically to prevent feedback, indicated with red light signalling and automatically following the source wherever it is used. When used in the two-step topology with the Studer Route 6000, inputs and outputs may be processed by various DSP algorithms such as delay or limiter, removing the need for further external processing hardware. Unlike some other routers, no inputs or outputs are lost when DSP resource is consumed – the I/O count is always true. The Route 6000 can be controlled via the VSM (Virtual Studio Manager) software for tightly-integrated control of routing, processing and monitoring assignments through customisable hardware and software panels. SNMP is used for system health monitoring and local/remote surveillance and messages can be sent to control terminals highlighting problems. Additional functionality in the new software release for Studer Vista consoles includes DAW control. This allows Vista consoles to interface to a wide number of the available DAW systems on the market and control key functions such as track-arming, mute, solo and fader control. Connections are simply made through Cat5 rather than the cumbersome multiple MIDI cables found with some systems. As well as labelling and auto-labelling of DAW channels via the console GUI, it is also possible to write DAW automation from the consoles faders. For total peace of mind, RELINK incorporates extensive redundancy capabilities based on proven Studer hardware solutions. Overall, RELINK represents probably the most flexible, scaleable and integrated audio resource sharing system for broadcast currently offered. 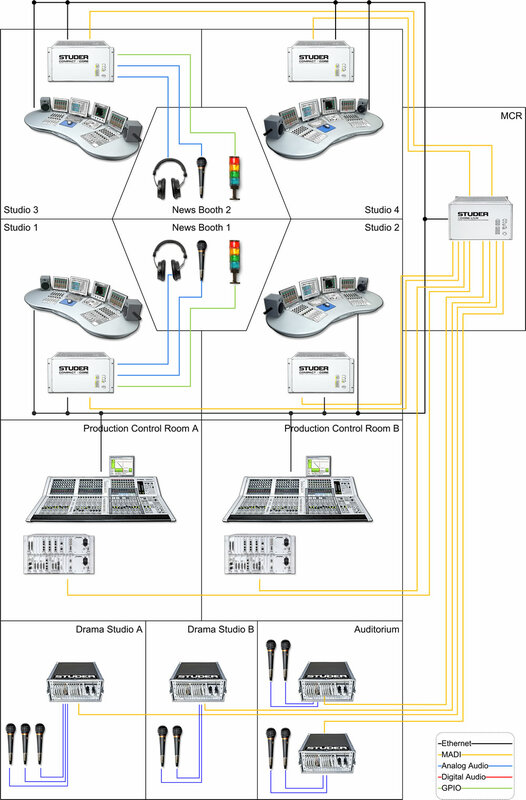 Previewed at the IBC in 2008, RELINK immediately received a STAR award from Broadcast Engineering magazine, demonstrating its appeal to this marketplace. Four further information on Studer RELINK and the Studer Vista and OnAir consoles, contact your local Studer Distributor.